Todolwen: That Tiny Bit Happier ..
That Tiny Bit Happier ..
don't you just love it when little things just make you feel that tiny bit happier about yourself?! I came across a photograph someone pinned on Pinterest a few days ago. It was a very nice photograph of something lovely. 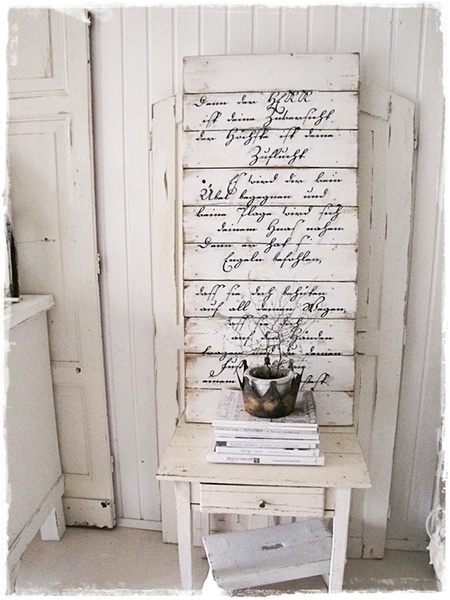 In this case it was of a part of a room with what looks like a piece of old fencing that had been white washed and had some script written on it. I have tried research the owner but I haven't been too successful so far but as soon as I am, I will add the name to this post. But I would like to thank who ever did take the photograph and who ever made the creation shared. Why am I sharing this?! ... Well, it is something that made my day. The lady that had pinned this wasn't sure what the writing was about ~ she thought it might be a poem or so. Looking at it for a little while, it started to look somewhat familiar to me and suddenly I was able to read the first few words. I was so happy! ... I recognized it to be something I had seen many times before. It was 'Alt Suetterlin' font which is a very old German font. My German Grandma, who was born in the late 1800's taught me how to read this when I was a little girl and ... I can still read it today! Big smiles! So after reading the first few words I researched a little more and found out what it was saying. der Hoechste ist deine Zuflucht. und keine Plage wird zu deinem Haus nahen. To guard you in all ways. I would love to get a copy of the script so I could create my own piece with it or maybe now I will just have to learn how to write 'Alt Suetterlin' too. I wish you all that something little makes your day today and makes you that tiny bit happier about yourselves! What a wonderful story - I really hope you are able to find the origin of the photo - perhaps she would like to know the English translation. How special, Karen! And yes..the piece is very lovely and how beautiful the words. I hope you can find the origin. It's so nice when people can get credit for their work. Thank you for sharing that special memory with us. Hugs and wishes for a blessed week. How wonderful, Karen! I love this story so much. Finding a little happiness like this is always good. Well spotted, congrats! It is indeed a really gorgeous font, and I would love to add that to mine as well. The photograph is lovely, I am not surprised it appealed to you straight away. I hope you find out all about this piece. The wonders of the internet...fun surprise for you! Interesting story here! Gorgeous font, and how clever of you to be able to read it! Thanks so much for sharing this lovely piece, dear Karen. What a great story about some old writen words :-). P.s. : I can't read it! A Little Junking I Did Go ..
My Worktable Is Blooming ..
At Last Spring's First Appearance ..
A Few More New Nest Listings In My Etsy Shop .. The 'Other Half' Creation ..
'Christmas To Come' Giveaway 2015 .. Now Closed! Grateful For The Little Things ..
My Little Rant About Me, Myself And I ..
A Little Surprise For Me ..
With Easter In Mind ..